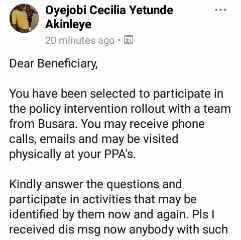 You have been selected to participate in the policy intervention rollout with a team from Busara. You may receive phone calls, emails and may be visited physically at your PPA's. Kindly answer the questions and participate in activities that may be identified by them now and again. 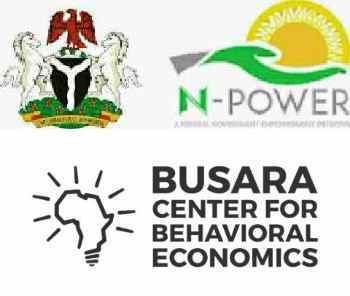 This might be a possible partnership between N-power and Busara which we have to wait for Npower to publicly come out and clear the air on what the message is all about. Busara Team: Behavioral science is a highly interdisciplinary field that draws on methods and insights from psychology, anthropology, economics, data science and more. Our team combines academic rigor with strong private sector experience to build evidence driven yet pragmatic engagements. Our 40+ engagement teams and 130+ staff members are decidedly global to ensure our interventions are leveraging cutting edge behavioral science but also grounded in the context and cultures we work in. Our staff come to Busara with a diverse set of expertise in health, education, economics, political science, finance, gender, development studies, behavioral science, mathematics, environmental studies, anthropology, and nutrition. Busara work: always starts with removing assumptions and pre-conceived notions about culture and context to look at the world through a fresh perspective. We spend a long time listening, learning, designing and discarding potential solutions before we find the ones that may work. Then we test, scale, break, and iterate, again and again until we have it right. The above information is what we find out about Busara. So, let wait for Npower to explain more on this.